KISS are being sued by the estate of drummer Eric Carr over unpaid royalties. For years, Carr’s heirs believed they were only due royalties from the American Society of Composers, Authors and Publishers (ASCAP). “They thought they were getting it all from one source,” said Robert Garson, the estate’s attorney. The heirs realized that they should have been receiving payments from KISS entities including the current group, two publishing firms and Gene Simmons Worldwide Inc.
Records reportedly show reps for KISS stonewalled the estate’s attempts for information, blaming the delays on the band’s touring schedule and overworked accountants. 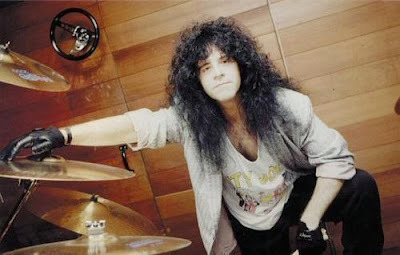 Carr (born Paul Charles Caravello) joined KISS in 1980 following the departure of original drummer Peter Criss; he recorded eight albums with the group. On April 10, KISS will be inducted into the 2014 Rock & Roll Hall Of Fame at a ceremony in New York, along with Nirvana, Peter Gabriel, Hall and Oates, Cat Stevens and Linda Ronstadt.